Frustrated with the current storage solutions for your products and their inability to meet your customer’s frequently changing needs? The X-Series Bracket System may be for you. Compatible with both side and under-mounted slide systems, the X-Series Bracket System is designed to be used with most industry standard slides. Once the brackets are in place, changing their orientation and height is as easy as disengaging them from plasters and moving them up or down before locking them back into place. That flexibility makes it easy and convenient to store items, parts, components, and materials of different sizes in the same cabinets and drawers. 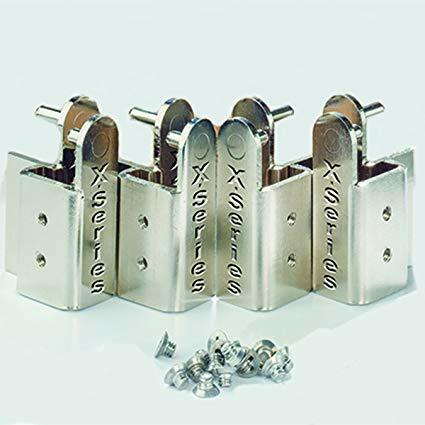 Best of all, they can be adjusted completely by hand—no tools are necessary to take advantage of the X-Series Bracket System’s flexibility and ease of use. Installing the X-Series Bracket System in your products is fast and easy. Best of all, it’s easy for your customers to use as well. After it’s set up in their storage solutions, they’ll be able to easily accommodate a variety of object sizes without needing to use tools or take time out of their days to change shelf and drawer heights. At Byler Industrial Tool, we’re excited to offer this product in kit and bulk bundles and pricing. Get the solution your customers demand. Call us today at (615) 763-6227 or submit an online contact form to place your order.